And so my IMDB challenge and Clint-Eastwood cycle continue. Today I will touch upon a film I watched over a month ago that I never got to review until now. While some details might disappear in time, what remains important and true about a movie that I saw more than a month ago is still fresh in my mind. In a way, it sometimes proves more useful to let a film seep in and settle until I am prepared to emit a judgement that is not limited or determined by my initial impression, which can be severely flawed. 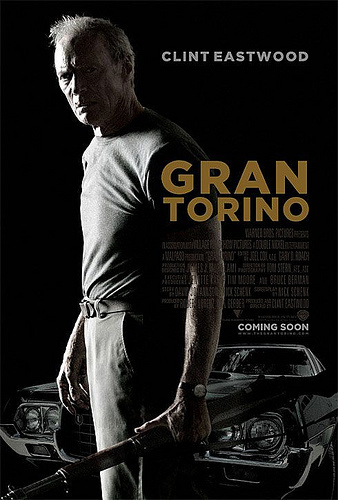 Having said that, Gran Torino, directed and starred by Clint Eastwood, has lost some of its initial appeal and I have come to view the film as one that is strong and solid as its core but a bit weak as a whole. In a gist, Gran Torino is a story about self-discovery and personal growth. Of course, the film touches upon other subjects such as racism, intolerance, urban decay, violence, cultural division and family relationships. However, in the course of almost two months since I had the chance to watch it, Gran Torino stuck in my mind as a piece of work that tries to explore the idea that race, gender and racial lines can be overcome and that, as a result, we can learn more about ourselves and the world. This is the journey of Walt Kowalski (Clint Eastwood) in Gran Torino. Having lost his wife, Walt is presented to us as a grumpy old fellow that is as stubborn and stuck in his ways as they come. Walt has a very specific image of people in his head, often letting his first impressions dominate his behavior towards others. He is disappointed and bitter about the passing of the only woman that he tolerated and that tolerated him in return. He is also frustrated at his surroundings. Walt has a family that seems to have fallen for every stereotype of the contemporary suburban household. He is also in the middle of a neighborhood in Detroit that has progressively deteriorated. What used to be a blue-collar prosperous community, now has turned into a culturally diverse community of immigrants (some illegal I presume) of limited means and very different values to what he is used to. Walt does not want to leave his house or his belongings. He had picked the land decades ago and he would stick by it to his death, or until it miraculously begins to turn around. Why should he leave? he thinks. He feels he is more worthy of the land than any of his new neighbors, having worked for decades to own what he owns, saving a good part of his income to build his favorite toy: a 1972 Gran Torino. When his most-prized possession is threatened, all of the frustrations and misconceptions of Walt come to the surface. Slowly but surely, Walt is forced, by an unlikely series of events, to get closer to the same next-door neighbors he has grown to despise for quite a long time. These include a couple of Korean teens that after having been in the wrong, show him that they are good at heart, forcing Walt to reconsider and ultimately embrace them as a kind of protector to the many outside threats present in modern-day Detroit. As he grows closer to his new friends, Walt becomes more involved with their isues and especially with their problematic connections to gangs that rule the community. Eventually, Walt realizes that life has given him a new purpose and, with that, new responsibilities. In his new role as patriarch of the community, he is willing to go far and beyond what everyone expects in order to give his friends a better future, ridding them forever of the threat of the gangs that seem determined to ruin their lives. As it is common in Eastwood’s body of work, the film works itself out to have a meaningful message submerged in between the lines of the script. He builds his movies to what usually seems to be an unavoidable end that we try to avoid as an audience, but that ultimately comes to its tragic, yet uplifting conclusion. Usually, the climax of Eastwood’s films comes in the form of violence which represents a perfect vehicle for his underlying messages about humanity to come across with a splash. Gran Torino is, in this sense, yet another careful study about humanity and, more specifically, about our ability to sacrifice for others while getting rid of our misconceptions about cultures and styles of life that are foreign to us. As accomplished as the story is, Eastwood’s Gran Torino fails to reach great heights because of the unpolished quality of the film. The casting is good, but not great, and Thao, played by Bee Vang, seems like a specially odd choice. Sometimes there are movies that benefit from having an unpolished quality, which can enhance the realistic sense of a film. However, Gran Torino feels unpolished in a way that is often apparent and awkward, getting in the way of our experience as an audience. There are scenes that seem to have been rushed, perhaps falling victim to the low-budget and to the directorial style of Eastwood, who usually encourages very few takes and little rehearsal. Such a way of filming can accomplish great results with a talented and experienced cast, but not as much when the actors lack the expertise and/or the talent to make it work on the big screen.